Over the last decade the number of start-ups in the New York City area has exploded. New York now ranks second in the nation behind Silicon Valley, and its numbers are growing at more than twice the pace of its West Coast competitors. To some degree, any business being launched from scratch is a "start-up." However, over the last decade the term has taken on providential airs. The ideal start-up promises to disrupt conventional ways of doing things, imagine novel social orderings, and remodel our commercial and personal interactions. For the next few months, I will dedicate this blog towards profiling young New York City start-ups that appear to be fulfilling this promise. Emerging Collective: serving emerging artists from emerging markets. Emerging Collective is the brain child of Raj Udeshi, a graduate of ex-Mayor Bloomberg's technology incubator, and the co-founder of HiddenLevers, a macro stress testing and predictive analytics technology company. Founded barely seven months ago, Emerging Collective intends to challenge today's euro-centric art market by fostering north-south dialogue and cultivating artists from emerging economies. 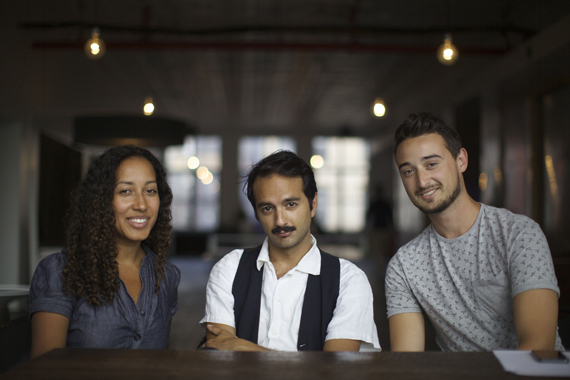 What's it like launching a start-up in New York? Raj: As the financial crisis was happening in 2008-9, Bloomberg worried that there would be a talent exodus from New York. And it's true, lots of talented people left for Asia and Europe. Atlanta, where we have HiddenLever's other headquarters, was also a big receiver of New York people. Bloomberg wanted to prevent this, so he began cultivating cheap office space. Also, he decided to pivot the spotlight towards start-ups and away from Wall Street. He began attending NYC Tech Meetups, and now they're creating this giant tech campus on Roosevelt Island, trying to make the future of tech come to New York. When I founded Hiddenlevers in 2009, the cofounder was in Atlanta, and we had 4 people in New York and 4 in Atlanta. Soon though we decided to shift all our operations to New York, not only for the finance connections but also for the cheap office space. Partially thanks to Mayor Bloomberg's efforts, there are all these new co-work spaces with à la carte pricing. Everything's month to month. If I were to do this in Atlanta, or in Chicago where I grew up, I would have to sign a year-long lease, and go through a credit check. Here I just sign up for month to month and they accept me if they like my business plan. I can grow organically, expand and contract as I want. All services included. Sure, in Atlanta, you have tons of people who work out of garages and homes. However, I feel that starting a real project requires a certain level of professionalism. You need office space where you can come to work properly, and where you have to prove yourself. How has this changed the start-up ecosystem in New York? Raj: The explosion of co-working spaces has revolutionized the environment for start-ups. Above all, there's the water-cooler effect. It's amazing to have all these creative minds working together. I get advice from the other entrepreneurs; learn from them and they learn from me. For instance, when I was in the Bloomberg incubator, whatever resources or ideas we had would be especially bolstered by the people who didn't like our ideas. We'd go back to the drawing board and figure out something better. How has it been moving from a finance start-up to an art one? Raj: I think there's actually a lot of cross over. Lots of management principles are the same, and skills like people management, and business sales. For instance, I use the same gorilla methods to find spaces for my artists that I used before to acquire financial data. We have a tech start-up mentality for Emerging Collective, even if it is officially an art non-profit. Being in New York makes that easy. The New York brand is very helpful for tech, art and finance. There's so much great talent coming out of the local art and business schools. So talent recruitment is a lot more seamless. People are coming here to make their dreams happen. If you're trying to do something next level, you come here. How does that contrast with Silicon Valley? RaJ: Unlike in the Bay Area there's a lot of industry expertise in New York. You have all these people with great experience, who are disillusioned with their various industries. So you get exiles from those industries who move into start-ups. For instance Karima and Asa both took pay-cuts to make things happen over here at Emerging Collective. All the industry expertise in the Bay area is tech, so it's internal. Here in New york, there's fashion, finance, retail, event planning, the art world. There's tons of different industries, so you can staff up all sorts of start-ups. What do you think attracts people to start-ups? Raj: People like the work-life balance of start-ups. For kids coming out of school now, there's a lot of disillusionment with the government and with traditional companies. For instance, there's a lot of time wasted in corporate jobs. People hang out, and there's all this unnecessary face-time. For people interested in working really hard and building something, start-ups are the way to go. What do you think makes a start-up successful? Did you have good investors for HiddenLevers? Raj: HiddenLevers is entirely bootstrapped and self-funded. We are really rare that way. We never did a round of fundraising. When you use cloud-based software, your business is very scalable. You can build it up organically. People think that getting Venture Capital (VC) funding is winning, but it's just getting started. I was never interested in that model. It means you have a gun to your head and a real job. Go big or go home. Instead I built a small business, which I have been continuously scaling. If you want your project to be successful, you need to take advantage of three or four macro-trends in the larger economy. It can't be you against the river. The river has to go with you. For HiddenLevers this was the growth of big data analytics, stress-testing by the Federal Reserve, and images as communication - visually representing market trends. For Emerging Collective, two macro trends are the explosion of globalization and a new focus on emerging markets. Phaidon, the publisher, recently came out with a book called Cities of the Future that focuses on the global south. Also the next Ted Global Conference is called Ted Global South and will be in Rio de Janeiro. You are also starting to see action in all these new markets; not just the BRICS but even peripheral ones. It's really exciting stuff. Not just China but Lebanon. Another macro trend is a new hunger for immersive experiences. People expect more from the shows they are going to. People want to see, touch, feel. In this era in which material items are a commodity, experience is a luxury. Live music is back. People want to have a look inside the creative process. They want to see how the food is made. So we want to work with artists who create an experience. Where did you get the idea for Emerging Collective? RaJ: The idea came from a group of people, friends and associates, who travel frequently in the global south (Sao Paolo, Hanoi, Hong Kong, Beijing, Delhi, Bogota, Beirut, Johannesburg). You see a lot of those places sending people to and from New York; lots of migration. The art scene in these areas is dynamic. There's this really incredible mix in these Southern urban centers of tech savvy, economic growth, and geo-political stakes: the emergence of democracy from political oppression (Bogota, Hanoi), or, conversely, the descent into chaos in Syria or Egypt. The way to tell these stories is through art. Especially since journalists are often killed in these places for writing the truth. So people who want to expose these issues turn to art. We think the art scenes in the global south deserve more exposure. The art market today is too euro-centric. For instance, even though China is now the world's biggest art market, you don't see enough Chinese art. This is part of the nature of the gallery scene. It's tough to crack into it as a new artist. Asa: Raja and I met at Art Basel in Miami, and we were both tired of white wine, white walls, and white people, as the environment for viewing art. New York is hungry for new ways to engage in art and society. I saw this project as potent and promising. Raj: Very central to what we do is expanding the north-south dialogue, finding a common ground between the emerging world and mature markets. We try to cultivate a mentality of not having the US and Europe in control of everything. RaJ: We have a mentorship program; a dual artist residency. One globally recognized senior artist and an emerging artist; a top talent, who will be a future star. We have them come from different parts of the world and meet. New York is littered with world-renowned artists, and we've already seen significant interest from big name artists to do something like this. The north-south dialogue is something that will become more and more important over the next fifty years as the world gets smaller and as this country also gets smaller. So what will be your first exhibition? Our first exhibition will be a renowned Chinese activist artist living in exile, and a younger Iraq war veteran from here in the United States.